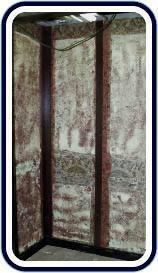 We manufacture and install custom elevator cab interiors. Elevators are the heartbeat of most buildings over two stories tall. When visitors arrive at your building and step into the elevator, are they being presented with a first class appearance? 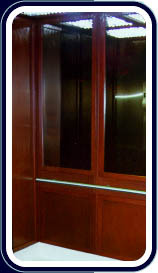 We can improve the appearance of any elevator cab by renovating the interior, lobby doors, and elevator lobby. We will take your design and develop it into reality. We also offer a design service to help you meet your design requirements. The elevators shown here are in the 55 Public Square in Cleveland, Ohio. 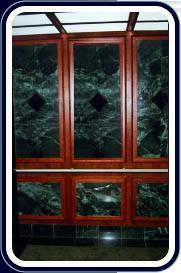 This design utilizes Green Verde Marble, Black Absolute Granite, and cherry wood. The elevators shown here are in Marriot hotels in various cities. Cherry wood and silver mirrors were used in these designs. Both designs present an elegant appearance as compared to the original interior which had a dated appearance. 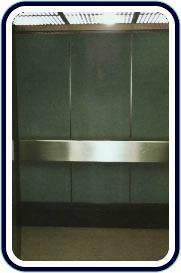 A wide variety of materials are available to complete your elevator designs. Custom interiors can consist of woods, laminates, glass, marbles, granites, plastics, carpets, solid surface materials, and metals (steel, bronze, aluminum, stainless steel, and custom finished). We can help with your next renovation as well as new installation.